Bill Lyon (right) with “the man in the white coat,” Penn Memory Center Co-Director Dr. Jason Karlawish (left). As an award-winning sportswriter for The Philadelphia Inquirer for more than 40 years, Bill Lyon has seen both the pain and the triumph of the game. Now, Mr. Lyon is fighting his own battle, living with the diagnosis of Alzheimer’s disease. 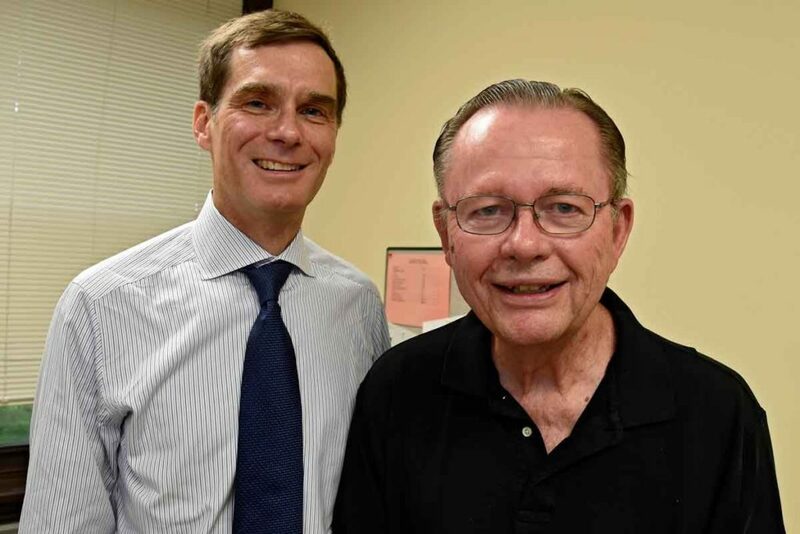 Mr. Lyon was 75 when he was diagnosed with Alzheimer’s disease at the Penn Memory Center. After writing an initial series of five columns last summer for The Inquirer, Mr. Lyon has continued to write periodically about his experience living with the disease. Mr. Lyon’s doctor, Jason Karlawish, MD, co-director of the Penn Memory Center, also wrote a column that coincided with the last installment of his five-part series. Mr. Lyon writes in complete honesty about physical discomforts and involuntary bodily functions he experiences due to his disease, his realist view about his diagnosis, and his difficulties coping with his nemesis “Al,” the nickname he gave to Alzheimer’s disease. Mr. Lyon still somehow manages to pull humor from his situation and entice the reader to follow along on his journey. In this June 16, 2016, installment, Mr. Lyon describes changes he has noticed in his behavior, both voluntary and involuntary, due to his diagnosis of Alzheimer’s. Mr. Lyon also notes the feeling of freedom in handing off his finances to his son. On June 26, 2016, Mr. Lyon recalls his last years of driving and the difficult decision between him and his doctor to give up the keys. Mr. Lyon also writes of his rewarding experience teaching a Creative Writing class at a community college. From this July 3, 2016, side-by-side column about Bill Lyon, Dr. Jason Karlawish describes his role in Lyon’s life and diagnosis, as well as his thought process behind giving Lyon the diagnosis. He also describes why the Penn Memory Center and similar facilities are so important for those with cognitive impairment and disease. February 24, 2017, finds Bill Lyon struggling to accept using a cane for balance, ultimately deciding he will use it so that “Al,” what he calls Alzheimer’s disease, won’t win. In Bill Lyon’s latest ‘one in an occasional series,’ from June 5, 2017, he talks about sleeplessness and seeing ‘ghosts’ manifesting from eye floaters. Mr. Lyon continues to fight against ‘Al,’ saying “we’ll not permit him an inch of surrender. Remember our mantra: Resist. Persist. Never, ever give up.” Mr. Lyon then discusses his late-onset love for hugging. Accompanying Bill Lyon’s October 5, 2017 column is one from his physician Jason Karlawish. Dr. Karlawish writes about Mr. Lyon’s crusade aimed at changing the culture around Alzheimer’s disease, to combat the stigma surrounding the disease. “Bill took a big and uncommon risk, and his sacrifice is our reward. We feel not only our sufferings, but also the sufferings of others,” Dr. Karlawish writes. Bill Lyon’s wife of 52 years, Ethel, passed away in March 2018, and in his column published on March 20, 2018, Mr. Lyon reflects on their life together. “My wife, Ethel Lyon, was my middle linebacker, and over our 53 years together, I came to believe that she was indestructible. She survived cancer and emphysema and 12 major surgeries. But always, she came back, and she was fighting to the end,” he writes. In his column published on May 30, 2018, Bill Lyon writes about two special therapy dogs, Darla and Harvey, who live in his continuing care home and provide him solace in his battle with Alzheimer’s disease. “They ease the pain and the sting of the issues with which I struggle,” he writes. Bill Lyon is a retired Inquirer sports columnist and can be reached at lyon1964@comcast.net. Columns will be added to this page as they are published on philly.com.